On of my favorite movies is Under the Tuscan Sun! I love watching it and imagining myself cooking, eating, and drinking luscious food and wine on a blanket under a big tree. In this blissful Italian daydream I would need a cocktail. And what better way to capture the essence of the countryside than with oranges, lemons, rosemary, and Amaretto, my creation The Tuscan! This total crowd pleaser can be mixed in advance, stored in the refrigerator, and poured over ice to get the party started. Cheers! First, fill 6 double old fashioned glasses with ice. Zest 6 large peels of orange. In a large cocktail shaker, muddle the leaves of 3 sprigs of rosemary and all the orange slices to a rough pulp. Add ice to the cocktail shaker. Pour in the Amaretto, vodka, Grand Marnier®, and lemonade. Top the shaker and shake vigorously for 30 seconds. Remove the top and pour through a fine strainer evenly into each glass. Garnish each glass with ½ of a fresh rosemary sprig and one large orange peel. Serve immediately. Say cheers with this Italian stallion of a drink! So much of what I create in the kitchen is sparked from memories, both adult and childhood. I remember my dad (Ricky) always loved amaretto! As a child in the 80's, I remember the amaretto came in a black velvet box with a shiny lid that had a big red rose on the top. I actually still have some of those boxes that my dad gave me because I thought they were so incredibly fancy! My dad has since passed and those boxes now hold cards, letters, pictures, his cologne, and other small mementos of his life. It's a bitter-sweet feeling to look inside those velvet boxes, but when I do, the aroma of his cologne makes me feel like he is right there with me! I share this story with you because I want you to make this cocktail often, enjoy it for celebrations, and toast with love! I also hope that this inspires you to invent your own recipe for someone special! It's never too late to commemorate a loved one, whether passed or present! Love is the best ingredient, so use it generously! Share your story of inspiration in the comments below, I would love to learn what who has touched your life, and why. You never know when your words will inspire others! Fill 6 double old fashioned glasses with ice. Pour ½ cup of amaretto into each glass. 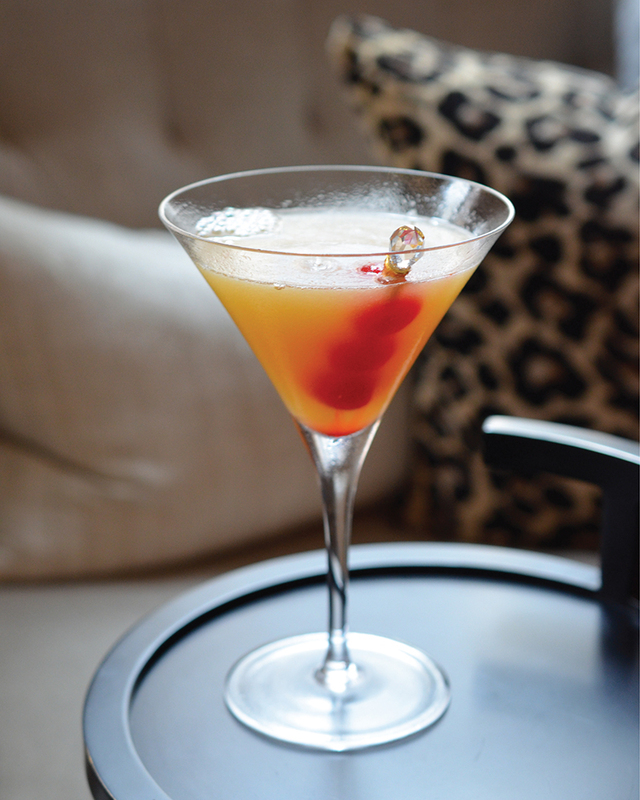 Splash with 1 tablespoon of Grand Marnier®. Sprinkle with ½ teaspoon of orange zest and garnish with a fresh orange wedge.